Clear Motion and Digestive Aid is a unique homeopathic remedy formulated to relieve abdominal distress, bloating, general nausea and motion sickness. 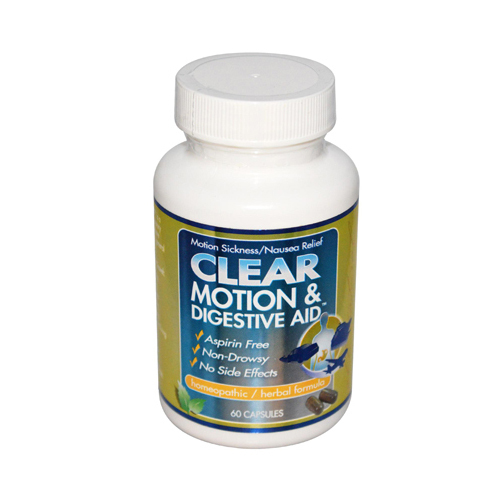 Clear Motion and Digestive Aid also contains a proprietary herbal formula. Free Of Aspirin Disclaimer These statements have not been evaluated by the FDA. These products are not intended to diagnose, treat, cure, or prevent any disease. Ingredients: Ginger Root, Atractylodes Root, Coix Seed, Hoelen, Magnolia Bark,Chrysanthemum Flower, Pogostemi Herb, Saussurea Root, Tangerine Peel.